Mohamed Abdullahi Mohamed, whose popular nickname is “Farmajo’ (Italian for cheese, from the imperial days of the Italian Somaliland) is president largely in name only since he the government he leads is not a functioning government and controls only small slices of territory. 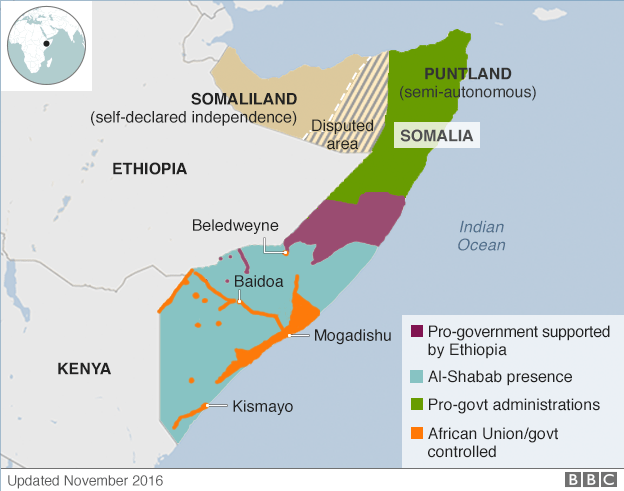 Somalia’s central government collapsed in 1991, and has not had direct elections since 1969. Mohamed was not elected directly by a vote of the Somalian people but by a vote of the 329 members of Parliament, an election which took place at the heavily guarded airport complex in the capital, Mogadishu, as the rest of the country was considered too dangerous to hold elections. There were initially 20 candidates for president. Sixteen had dual citizenship - nine held US passports, four UK passports and three Canadian passports. Unconfirmed reports said votes were being sold for up to $30,000 in a country heavily funded by foreign donors, and where most people living in the country are extremely poor. Mohamed won in the second round of voting over the runner-up, incumbent president Hassan Sheikh Mohamud. Mohamed Abdullahi Mohamed the newly elected President of Somalia. The war-torn nation of Somalia, located in the Horn of Africa with an estimated population of 12.3 million, has elected a Grand Island man with dual Somali-U. S. citizenship as its first president in decades. Mohamed Abdullahi Mohamed, who worked on former Erie County Executive Joel Giambra’s campaign in 1999 and later worked for Giambra on affirmative action compliance, won the presidency of the East African country in peaceful voting by parliament amid heavy security. The former county executive said Mohamed’s first objective is to bring peace, stability, and economic opportunity to the people of Somalia, one of the seven Muslim-majority countries listed in President Trump’s travel ban last month. “This is a great opportunity for the people of Somalia, the people of the United States, and people around the world because Somlia is a breeding ground for terrorist activity and the best way to stop terrorism in the U. S. and elsewhere is stop the terrorists from leaving Somlia, and he [Farmajo] understands that,” said Giambra, adding that Mohamed’s position as a world leader presents a great opportunity for him to work with President Trump in the war against terrorism. Mohamed lived in the United States since 1985 and served for less than a year as Somalia’s prime minister in 2010-2011. He holds degrees from UB and worked briefly for the State Department of Transportation in Buffalo after leaving his compliance position with Giambra. “This is a victory for Somalia and the Somalis,” Mohamed told lawmakers after he was sworn in, vowing to fulfill his campaign promises to improve security, education, democracy and the economy. After he came to Buffalo – where there was a large Somalian community – he joined the west side political organization of Carl Perla and met Joel Giambra (above). Mohamed also worked with Steve Pigeon when he was Erie County Democratic Chairman and Pigeon is said to have assisted Mohamed in getting support in Rumania. Somalia lies along the Red Sea and the Indian Ocean. bordered by Ethiopia to the west, Djibouti to the northwest, the Gulf of Aden to the north, the Indian Ocean to the east, and Kenya to the southwest has the longest coastline on Africa’s mainland, its terrain consists of plateaus, plains and highlands, it is hot year-round, with periodic monsoon winds and irregular rainfall. 85% of its residents are ethnic Somalis who have historically inhabited the northern part of the country. Ethnic minorities are largely concentrated in the south. The official languages of Somalia are Somali and Arabic, most people are Muslim, the majority being Sunni. Mohamed Abdullahi Mohamed, whose popular nickname is “Farmajo’ (Italian for cheese, from the imperial days of the Italian Somaliland) is president largely in name only since he the government he leads is not a functioning government and controls only small slices of territory. Somalia’s central government collapsed in 1991, and has not had direct elections since 1969. Mohamed was not elected directly by a vote of the Somalian people but by a vote of the 329 members of Parliament, an election which took place at the heavily guarded airport complex in the capital, Mogadishu, as the rest of the country was considered too dangerous to hold elections. There were initially 20 candidates for president. Sixteen had dual citizenship – nine held US passports, four UK passports and three Canadian passports. Unconfirmed reports said votes were being sold for up to $30,000 in a country heavily funded by foreign donors, and where most people living in the country are extremely poor. Mohamed won in the second round of voting over the runner-up, incumbent president Hassan Sheikh Mohamud. Trump hasn’t tried to have Mr. Mohamed deported yet, has he? I’m sure he’ll be very successful, as are most legally elected leaders of majority Muslim countries. Which one…Somalia or Grand Island?